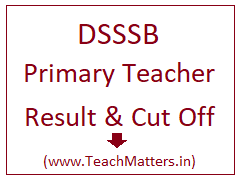 Latest DSSSB Result and Cut-off Marks for the post of Primary Teacher can be checked here as and when the Board declares the Official Marks List and Result Notice for PRT posts on the official website. Delhi SSSB has advertised various posts for the teacher at primary level (Primary Teacher, Assistant Teacher Primary, Assistant Teacher Nursery, Special Educator etc.) for the year 2018-19. Latest Updates on DSSSB PRT Result 2019 - DSSSB on 16.04.2019 released final result marks list of Teacher Primary, post code 16/17 & 01/18. (Check the detailed result given under concerned post code at the below). Online application for Primary Teacher post code 16/17 was invited by the Board and Written Exam held on 29.10.2017 was cancelled later by DSSSB. Afresh Written Exam was conducted on 30 September 2018 and 13, 14 & 28 October 2018 for PRT post code 01/18 or 16/17. The candidates are waiting for Result and Expected Cut off Marks of Primary Teacher exam September-October 2018 for post code 16/17. Candidates who had appeared in the exam can get an idea of their tentative marks after calculating their marks with official answer key of PRT Exam 2018. Candidates can share their marks here under comment section below and guess expected cut off marks of primary teacher exam 2019. Note : DSSSB PRT (16/17 & 01/18) Final Result Marks List has been released on 16.04.2019 & 28.03.2019. Expected Cut off Marks can be guessed here by many many ways - previous year cut-off marks of Primary Teacher Exam for all categories including UR, SC, ST, OBC etc. or we can discuss here current PRT Paper Level. Check here latest and previous year result and cut-off marks of Primary Teacher Post. Result Kab Aa raha h ??? ?